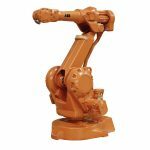 IRB 2400 is a 6-axis industrial robot, designed specifically for manufacturing industries that use flexible robot-based automation. The robot has an open structure that is specially adapted for flexible use, and can communicate extensively with external systems. The ABB IRB 2400 is one of the most flexible robots in the market in terms of the sheer number of applications to which it can be turned.